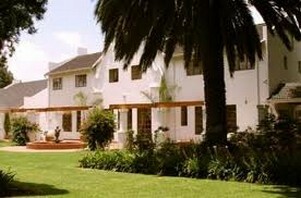 Set in panoramic gardens on the original old farm of Terenure in Kempton Park, Le Chateau Guest House and Conference Centre offers easy access to OR Tambo International Airport, Midrand, Johannesburg and Pretoria. Graded as a 4-star Guest House by the Tourism Grading Council of South Africa, Le Chateau is set in a panoramic garden on the original old farm of Terenure in Kempton Park. Your hosts take pride in their professionalism and the versatility of the facilities they offer. You can look forward to a warm welcome, superb hospitality and absolute confidence that your function will be an outstanding success. Situated in Kempton Park, Le Chateau Guesthouse offers easy access to Johannesburg International Airport, Midrand, Johannesburg and Pretoria and is conveniently placed to service the surrounding industrial areas. Your safety is important to us therefore you must know that Le Chateau is in a enclosed/security area, surrounded with High walls and an electric fence.